So I finished Banjo-Kazooie: Nuts & Bolts aaand, I'm pretty sure it's my biggest disappointment of this entire generation. I loved the first two games and I love old Rare, I really do. But that game is just so wonky, so poorly thought out, that I can't imagine the company I loved making it. Which is probably fine because I think a lot of the older guys left the company at some point. 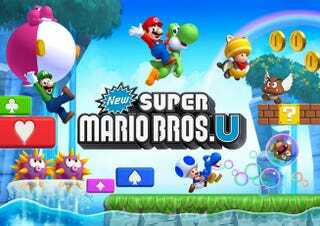 Which is why I then took it upon myself to relearn what a good platformer feels like, so I went back to New Super Mario Bros U, where I had really only just played through the game once, finding a few secrets here and there. Now I was on a mission to 100% the game (aside from hitting the top of every flagpole, that is tedious and there's no way to know which ones you have). After a bunch more hours, I am victorious and I have to say, if you think Mario's gotten too easy, you need to try to get every Star Coin and then do Superstar Road. Without a guide. Some of them are very cleverly-hidden, though never without some sign or way to find them so as to make them impossible. And some of those stages are just downright brutal (Run For It! being chief). I'd go so far as to say NSMBU is not only best NSMB game but one of the best 2D Mario games period. If Super Luigi U is more difficult and more crazy on design then I'll be in for a treat. As for right now, I'm not really sure what to do. I keep bouncing back and forth on some older games (Super Metroid, Super Mario World, FF9, some other stuff) because I'm just waiting for my copy of Resident Evil: Revelations HD to get here. And then DKCR3D. And also Grid 2 unlocks on Tuesday. You can probably tell why I don't really want to get too deep into anything with three new games staring me in the face. And of course there's the big elephant in the room, the XB1, staring at me. I'm kind of already done looking at it. Microsoft made its choice of focus apparent and I'm not in it so I won't be buying it. I don't care for the features it has and I am still largely in doubt that Kinect can even work properly in space as small as what I have so it's just out in general. Kind of sad really since I have an even 75,000 gamerscore so clearly I enjoyed using my 360 quite a bit. That really died down in the last year or so though and it's been pretty much unused aside from me finding really bad games to play on it (Neverdead, Aliens: Colonial Marines, Star Trek, BK: N&B). Have to keep it around though. I'm not getting rid of the thing that plays Lost Odyssey/Tales of Vesperia/Blue Dragon/Magnacarta 2/the good version of Bayonetta. So what's been keeping you busy this last week?